by Daly , Edward J.; Neugebauer, Sabina; Chafouleas, Sandra M.; Skinner, Christopher H.
Edward J. Daly III, PhD, is Professor of Educational (School) Psychology at the University of Nebraska-Lincoln. Dr. Daly is a Fellow of Division 16 (School Psychology) of the American Psychological Association (APA). He is a past Editor of the Journal of School Psychology. 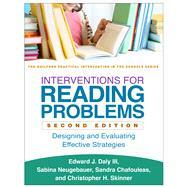 Dr. Daly's research is in the area of developing functional assessment methods for academic performance problems. He has coauthored or edited several books and numerous chapters and journal articles. Sabina Neugebauer, EdD, is Assistant Professor of Reading in the School of Education at Loyola University Chicago. She was previously a postdoctoral fellow at the Institute of Education Sciences, and a G. Richard Tucker Fellow at the Center for Applied Linguistics. Her research focuses on the language and literacy development of linguistically diverse students from childhood through adolescence. Dr. Neugebauer has published articles in a number of scholarly journals. Sandra Chafouleas, PhD, is Associate Dean of the Graduate School and Professor of School Psychology in the Neag School of Education at the University of Connecticut. She is a Fellow of both the APA and the Association for Psychological Science, and an invited member of the Society for the Study of School Psychology. She is a recipient of the Senior Scientist Award from APA Division 16. Dr. Chafouleas's research focuses on school-based behavioral issues and the application of evidence-based strategies in schools. She has authored over 100 refereed articles, book chapters, and books. Christopher H. Skinner, PhD, is Professor and Coordinator of School Psychology Programs at the University of Tennessee. He is a recipient of the Lightner Witmer Award and the Senior Scientist Award from APA Division 16 as well as the Fred S. Keller Behavioral Education Award from APA Division 25 (Behavior Analysis). Dr. Skinner's research focuses on enhancing educational outcomes for students with or at risk for disabilities by developing, evaluating, and disseminating contextually valid intervention procedures. 2. Where Do You Start as a Consultant? 9. Accountability: Are You Making a Measurable Difference?